In honor of several friends who have lost loved ones this week, and another friend honoring a yahrzeit, I wanted to offer this excerpt from a book I’m reading called Readings for Rememberance: A Collection For Funerals and Memorial Services, selected and with an introduction by Eleanor Munro. One unique aspect of Judaism I have always loved is its open embrace of mourning. Death is a deeply painful event, and Judaism isn’t shy about acknowledging and embracing this pain. Some religions do not regard our sojourn on earth as true life. They either teach that everything appearing to us here is mere appearance, behind which we should penetrate, or that it is only a forecourt of the true world, a forecourt which we should cross without paying much attention to it. Judaism, on the contrary, teaches that what a man does now and here with holy intent is no less important, no less true — being a terrestrial indeed, but none the less factual, link with divine being — than the life in the world to come. This doctrine has found its fullest expression in Hasidism. In their true essence, the two worlds are one. They only have, as it were, moved apart. But they shall again become one, as they are in the their true essence. Man was created for the purpose of unifying the two worlds. He contributes toward this unity by holy living, in relationship to the world in which he has been set, at the place on which he stands. I offer funerals in Mainline Philadelphia and surrounding areas. To reach me, please fill out the contact form found at SecularJewishFunerals.com. 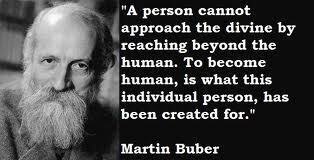 The fellow in the blue cap is not Martin Buber. It is Rajneesh, a Hindu.